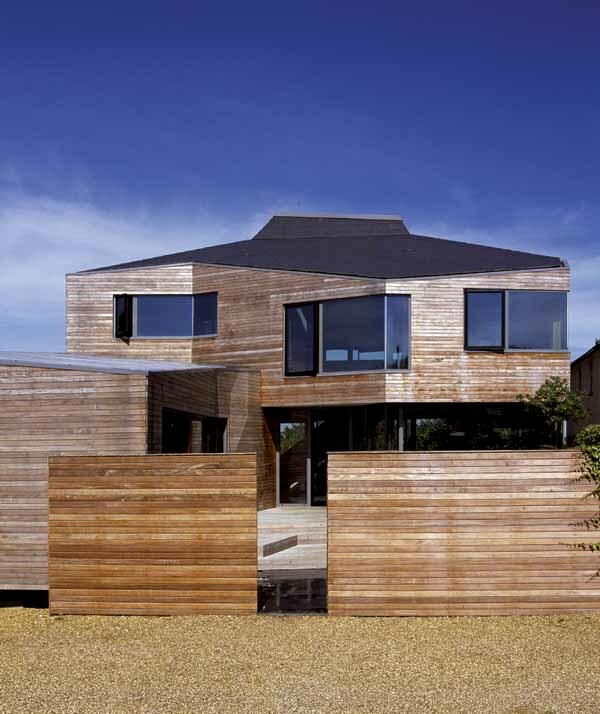 The Salt House is a rare example of a contemporary UK sea-side house. Constructed as a weekend retreat and future home to retire for the owners, Salt House carries forward the Modernist tradition of the experimental ‘beach house’ as a vehicle to explore new architectural possibilities- site specific yet containing the potential for wider application. 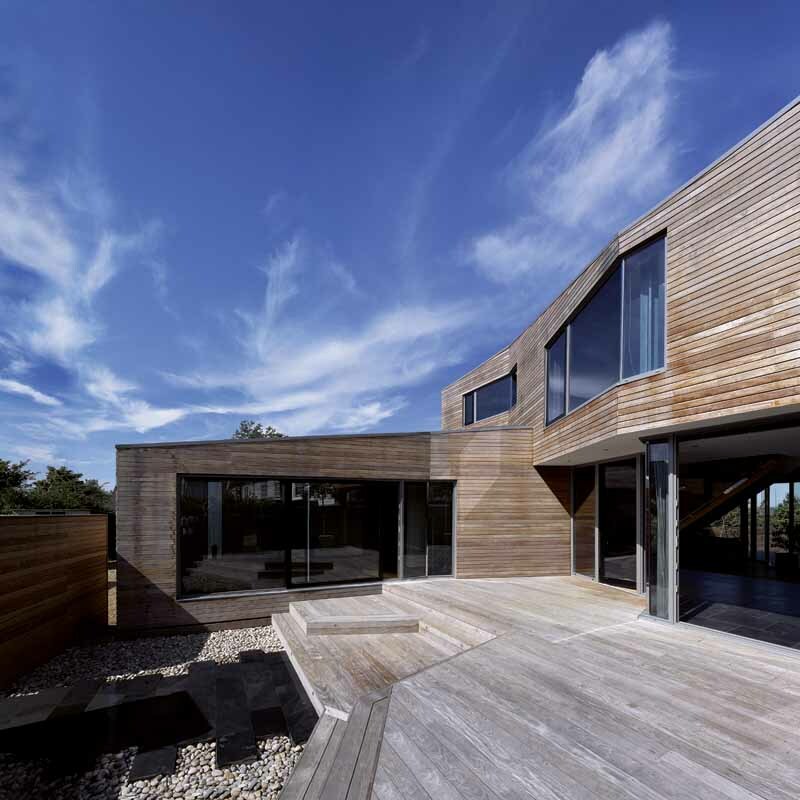 Extensively published in this country and abroad, The Guardian’s Architecture critic Jonathan Glancey described The Salt House as “one of the best new houses in Britain today”. 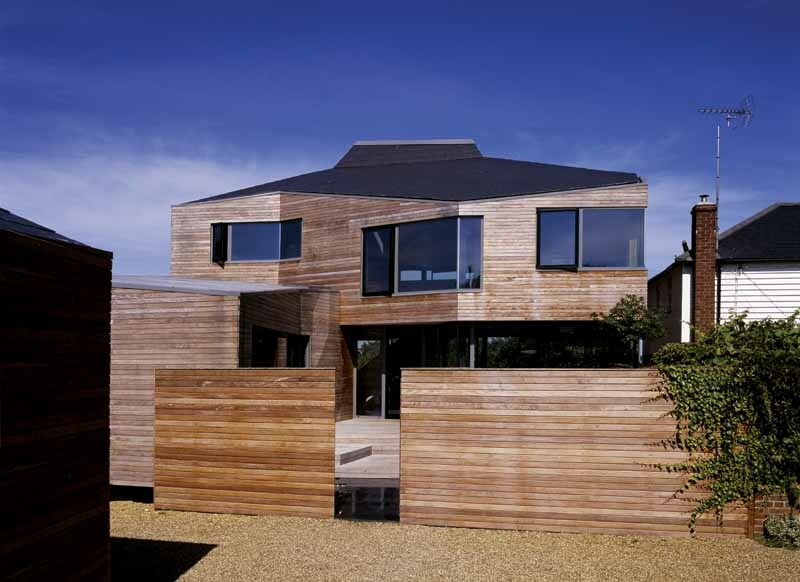 In 2006 the house won the Grand Designs Award for the Best New Build House of the Year. The client for Salt house is a couple whose parents live in the house next door, and the client spent all her summers there as a child. It is a new house with a long history! 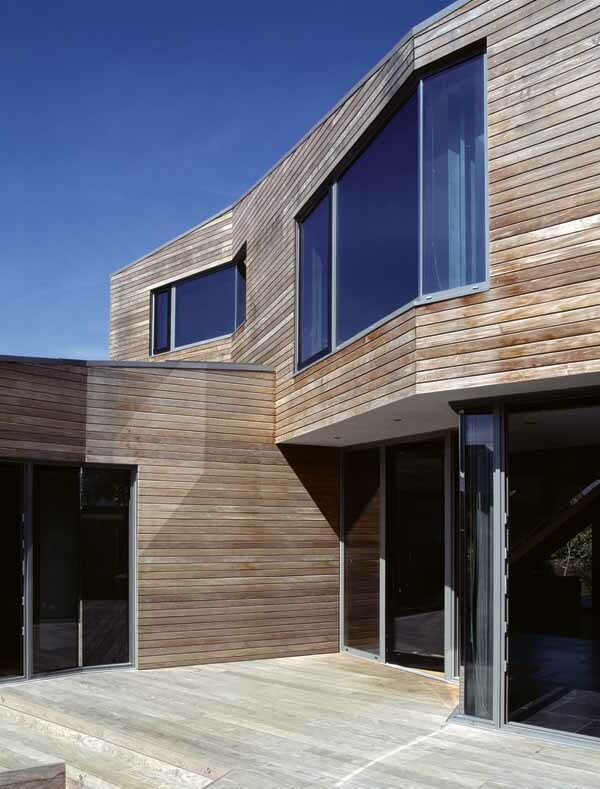 This project benefited from a quite specific client brief in terms of functionality – 3 beds/baths + guest suite, 3500sqft, no swing doors, a £450K budget – but complete openness in terms of form and materials. 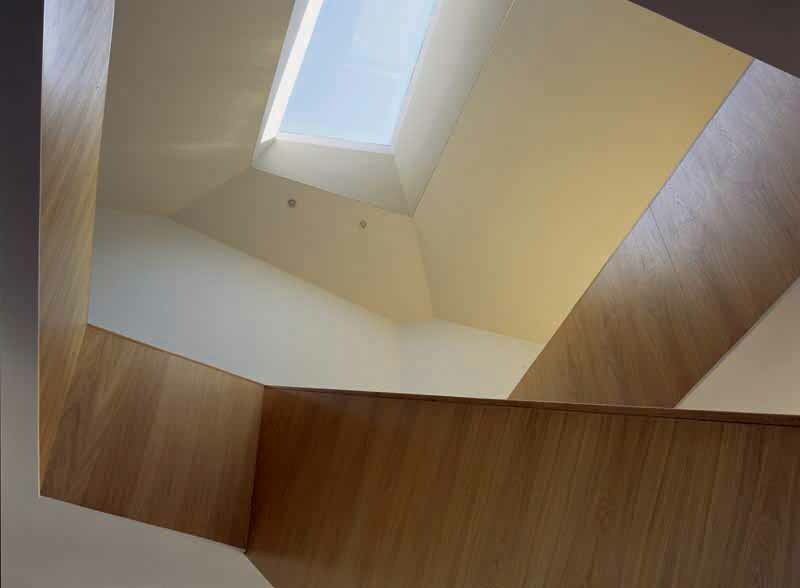 The client was interested in the atrium house typology, and in particular a strong visual connection from 1st floor to ground floor due to the special needs of one of the clients two children. 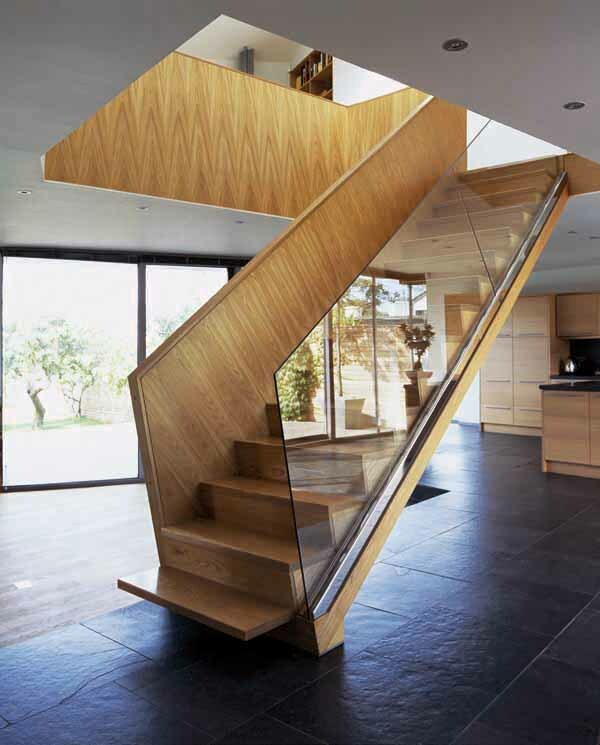 The project had the added demand of fulfilling the requirements of new building in a high-risk flood plain. We embraced these challenges, aiming to design a house sympathetic to its context – yet responding in a fully contemporary manner to the opportunities of a family ready for modern sea-side living. The two storey Salt House is located at the end of a terrace of 19thC timber-boarded oyster fishermen’s houses fronting a communal garden sheltered by a sea wall. Department of the Environment floodproofing measures required lifting the house above the level of its neighbours; this higher elevation means the house forms a ‘bookend’ to the terrace, balanced by the inn at the terrace’s opposite end. 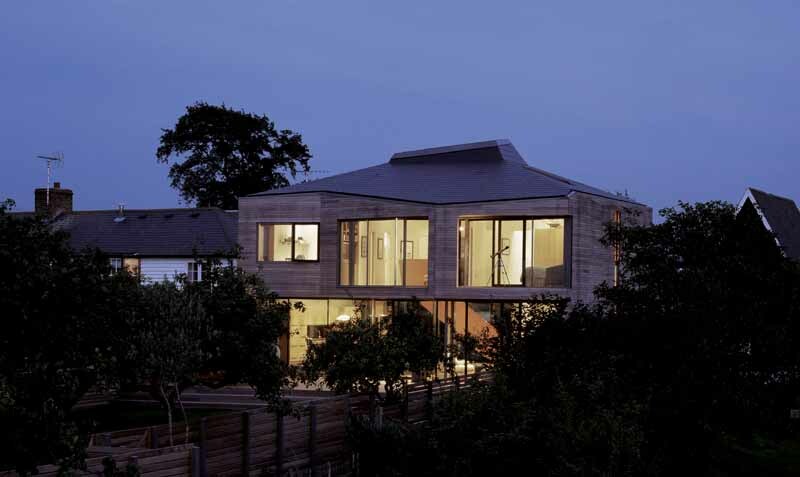 The form and geometry of the house re-interprets the local vernacular of hipped roof, bay windowed cottages. 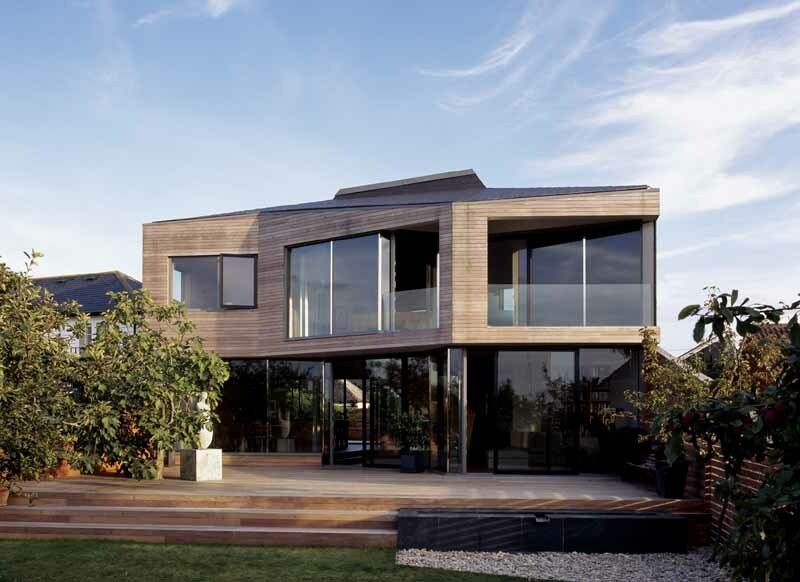 The facade ‘bends’ so that the entire north and south facing facades effectively become ‘bay windows’, maximising sea views to the north and passive solar gain from the south. The manipulation of the facades in turn deflects the geometry of the hipped roof to create an irregular, crystalline form. The three dimensional facade acts as an instrument for engaging with the communal garden, the land and seascape, while expressing the dynamic forces of the extreme North Sea weather. Framing the south facing entrance courtyard, the traditional single storey ‘outrigger’ typical of the lane entrances to the oyster cottages, naturally became a family room/guest wing. The house has neither a front nor a back per se. 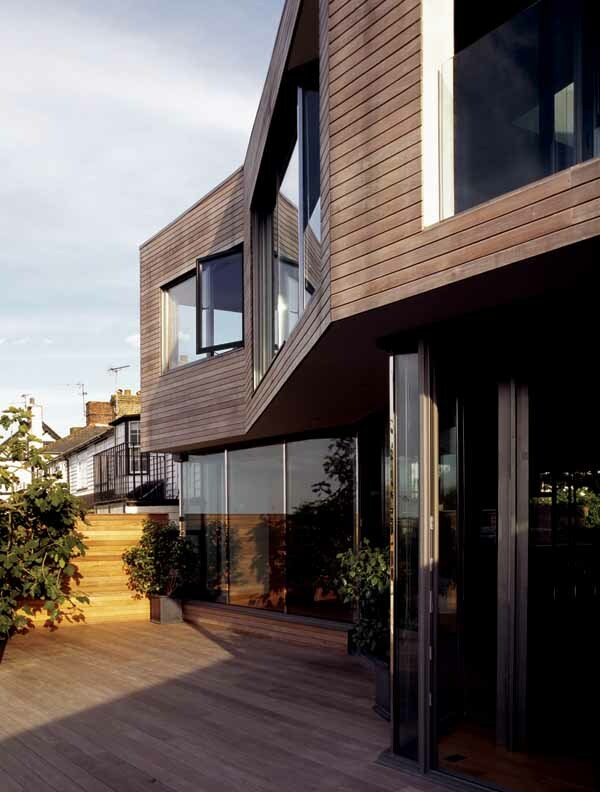 Both facades are highly glazed, permeable screens allowing cross ventilation and views through the house. Window and balcony openings travel freely across the facades expressing lightness and movement. The exterior walls and decks are clad in Ipe, a durable hardwood from sustainable forests that gives the house a silvery weathered shine. The roof is finished in synthetic slates, matching neighbouring roofs while enabling precision cutting around gutters, eaves and rooflights. Maldon Council was surprised and pleased with The Salt House proposals, exhibiting the project in a local exhibition of exemplary new architecture in Essex, and inviting the scheme to be submitted for local awards. Inside, interconnected spaces are ‘wrapped’ by wall and ceiling planes. The ground floor of the building is conceived as a continuous landscape that steps up from the entrance courtyard to the south facing timber deck. 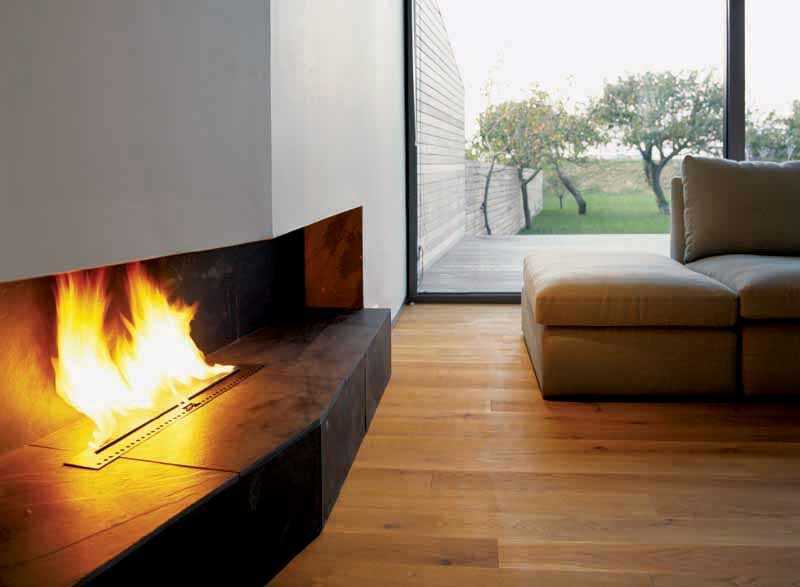 Huge sliding doors lead to the slate floored central atrium, ‘folded’ staircase and a sunken living area with a fireplace wall that extends outside to the deck, garden and beach. Upstairs, a second living space and study is bathed in light from the central atrium rooflight, with elevated views of the Blackwater Estuary to the west and St Lawrence harbour to the east. 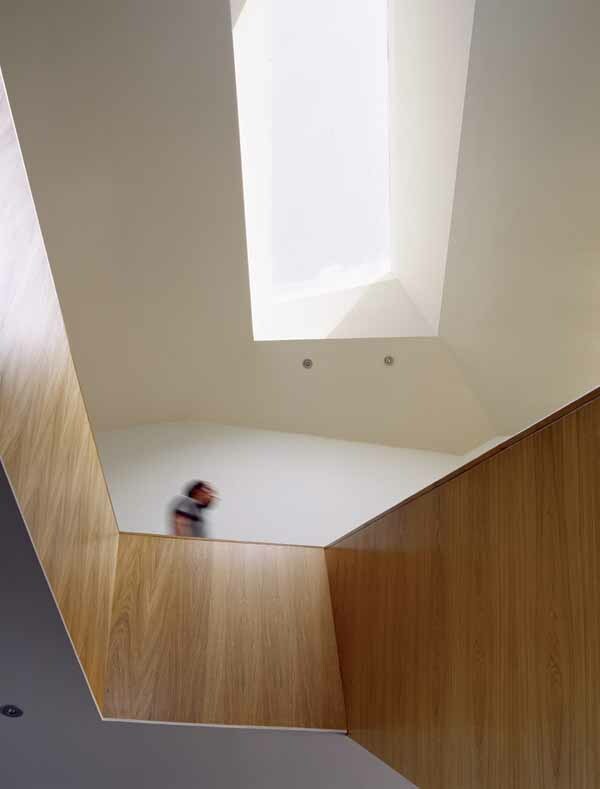 The space is framed by a series of folded element– the timber balustrades of the mezzanine fold downward to create the staircase, while the facetted walls of the 1st floor bedrooms are extensions of the trapezoidal rooflight geometry. From the very earliest stages, Maldon Council’s planning department was supportive of the scheme but required a full Flood Risk Assessment which was produced as part of the Planning submission. The design integrates extensive wet-proofing and dry-proofing measures, the most important of which was elevating the concrete slab on mini-piles. Not only do the mini-piles allow below ground water to flow past, reducing hydrostatic pressure on the foundations, they reduce site spoil to zero and, in the eventuality of long-term water level changes, the house can be jacked up to a higher level. Given this context Salt House is a prototype for flood-proof residential construction. The house is based on the structural principle of an elevated slab as the base for a steel portal frame. This allows two stories of column free interior space, corner windows, and a huge central rooflight opening, which doubles as a ring beam. Timber framing between steel elements is sheathed with marine ply to stiffen the entire frame. The owner describes Salt House as ‘a ship ready for the worst the North Sea can throw at it!’ A local builder’s craftsmanship, open-minded clients, and an attempt to sensitively transform a familiar local typology roots Salt House in time, place and family history.